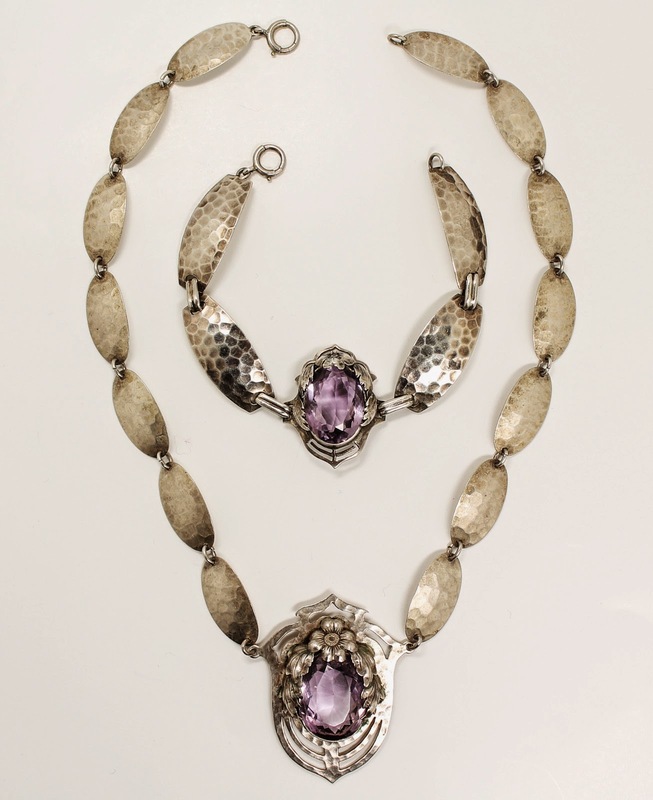 This antique bracelet and necklace suite is a beautiful example of the Arts & Crafts jewelry tradition of Chicago. While East Coast practitioners in the Arts & Crafts movement seemed to primarily focus on more medieval and colonial visual sources for furniture and silver, the Chicago silversmiths and artisans looked more to nature itself for inspiration. There were several important Chicago names, most notably the Kalo Shop, Randahl, Lebolt & Co, Jarvie, and many others. One of the hallmarks you will often see for early 20th century Chicago Arts & Crafts jewelry is "TSAS", for The Silver Art Shop. 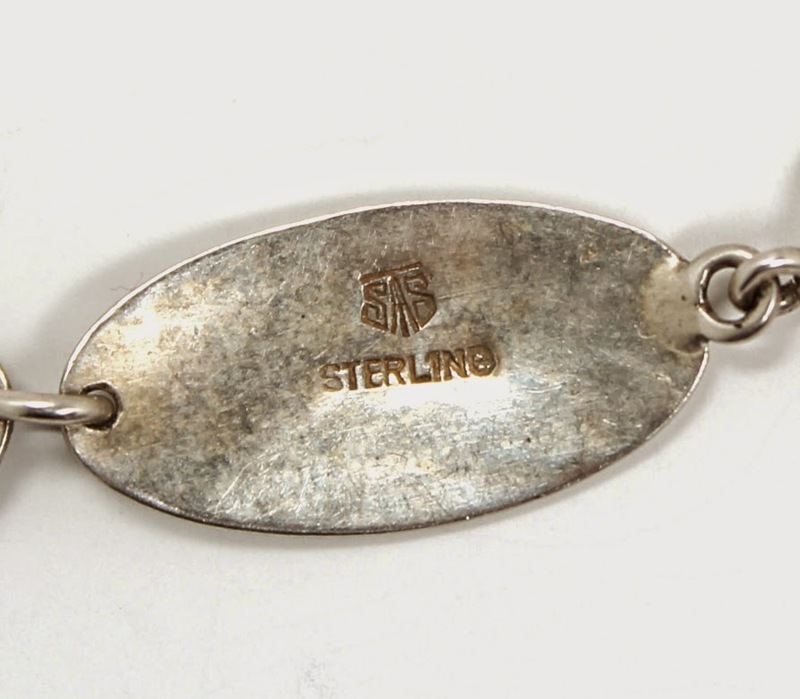 The company was founded by Edmund Boker and Ernest Gould, two Hungarian silversmiths with a background working in a Budapest factory creating objects for the royal families of Europe. Boker moonlighted at Lebolt & Co, their future competitor, to help bankroll the new venture. Boker and Gould first named their new enterprise The Chicago Art Silver Shop, but streamlined the name in 1918. The hallmark is a monogrammed TSAS in a sleek Arts & Crafts font.The design and repousse work was done by Edmund Boker, while Ernest Gould created the larger pieces. Many of the pieces from the Silver Art Shop tend to incorporate an Art Nouveau influence. This suite is directly inspired by nature with delicate floral motifs in strong contrast to hand hammered sterling silver surfaces and large gemstones. In 1934, business slowed to such an extent that the Shop closed its retail doors to focus on wholesale jewelry. The Silver Art Shop changed its name to the Art Metal Studios. Learn more about this Arts & Crafts TSAS necklace and bracelet suite here. Find more fine antique and vintage jewelry in our store.